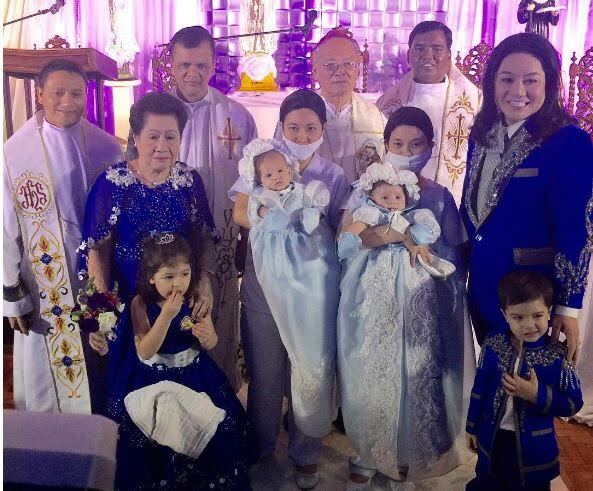 MANILA, Philippines- Fragrance mogul Joel Cruz came under fire after a photo of the christening of his twins spread like wildfire on social media. In the Instagram post by journalist Julius Babao, Cruz’s twins, Prince Harry and Prince Harvey, were seen carried by their nannies who were wearing surgical masks and hairnets. The photo sparked controversy after several netizens alleged Cruz of discrimination against the caregivers of his twins. On Wednesday, January 20, Cruz decided to break his silence and release a statement about the issue. Through a text message sent to ABS-CBN News reporter Mario Dumaual, Cruz revealed that he had the nannies wear masks when taking care of his twins, as advised by his pediatrician. The twins, who were conceived through in vitro fertilization (IVF) and were not breastfed, had a weaker immune system, according to Cruz. "Ayaw kong maging pabaya sa kanilang lahat at sinusunod ko lang din po ang advise ng pediatrician na mag-mask kami, nurse at mga nanny kapag close contact sa mga bata from birth until two years old,” Cruz explained. "...Ang kabutihan po ng paggamit ng mask ay maiwasan ang droplets o mga common organisms at 'yung ang nagiging reverse isolation. Ito po ay protection hindi lang ng mga anak ko kundi pati rin ng mga yayas at kaming lahat nanagsusuot ng mask,” Cruz added. Back in 2013, Cruz disclosed that his nannies for his older set of twins, Prince Sean and Princess Synne, had nannies who worked in shifts and wore uniforms as well as face masks in order to protect the twins from their coughs and sniffles. "For me, they are not the usual babies who were conceived through natural methods. They need extra care. They might be easily susceptible to diseases. For one year, I have to do this,” Cruz told Inquirer.